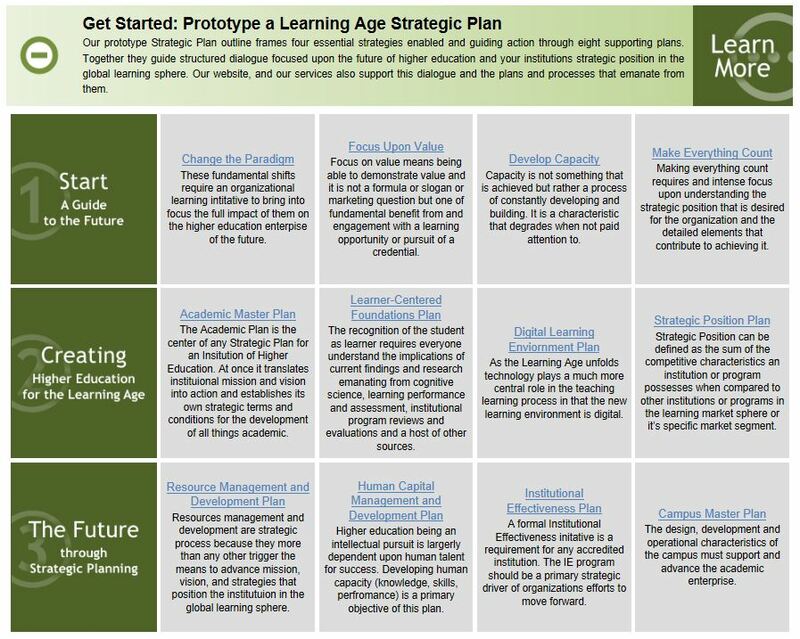 A prototype approach is an effective methodology to cut through barriers to planning, incentivize participants, and begin to develop a quick clear view of what a completed plan entails in order to address the known challenges emerging in the Learning Age. It focuses attention on twelve key areas that every institution should be prepared to address. Our experience in planning has shown us that barriers to effective planning fall into three general categories. First, is the category we call Misperceptions. It encompasses a wide variety of planning malaise ranging from a basic lack of understanding of what planning is and why it is done to a belief that planning is a SWOT analysis or table of Goals and Objectives with something called strategies thrown in to make sure it is a strategic plan. Second, is the category we call Fire-Ready-Aim. This is a group of issues that surround planning that range from extreme impatience with process to a belief that planning interferes with getting things done. “Paralysis by analysis, endless debate-little action, planning is a waste of time, I don’t have time to plan I have real work to do,” are all phrases that indicate a Fire-Ready-Aim culture. Third, in our general category list is the Disconnected. Collectively these leave planning completely removed from operations, budgeting, accreditation, management, and assessment. Our approach uses a Curriculum-Centered Strategic Planning process to cut through these various barriers to rapidly prototype a Strategic Plan that frames the output and its potential value to incentivize participants to iteratively improve upon the prototype eventually emerging into a real Strategic Planning and Management initiative. This prototype is not intended to hit every concept or focal point or even to pretend to be complete. It is a place to begin to understand the cohesive and comprehensive framework effective planning provides. Our framework begins with asserting four foundational strategies Change the Paradigm, Focus Upon Value, Develop Capacity, and Make Everything Count. While general, these four strategies provide a lens and structure for planning dialog. We follow the four strategies with the outline of eight supportive, and enabling tactical plans (charged and summarized in the prototype strategic plan) that operationalize strategy and establish a framework for structured dialog deep in the organization. Our recommendation as you begin, is harvest all of the planning products, research, analysis, assessments, plans, and outputs from previous work. Prototyping is not a starting over but a process of building upon what you have, bringing elements together in alignment with the emerging learning ecosphere, and organizing them for future refinement. It is also the first step in a dynamic process integrating planning and managing the academic enterprise and establishing the foundations for the future.